We’d love your help. Let us know what’s wrong with this preview of High Tide in Tucson by Barbara Kingsolver. With the eyes of a scientist and the vision of a poet, Barbara Kingsolver explores her trademark themes of family, community and the natural world. Defiant, funny and courageously honest, High Tide in Tucson is an engaging and immensely readable collection from one of the most original voices in contemporary literature. 'Possessed of an extravagantly gifted narrative voice, With the eyes of a scientist and the vision of a poet, Barbara Kingsolver explores her trademark themes of family, community and the natural world. Defiant, funny and courageously honest, High Tide in Tucson is an engaging and immensely readable collection from one of the most original voices in contemporary literature. To ask other readers questions about High Tide in Tucson, please sign up. Kingsolver's essays should be savored like quiet afternoons with a friend. ...She speaks in a language rich with music and replete with good sense." An enormously honest and personal collection of essays. If you like any of Kingsolver's books, I'm sure you will enjoy this one. This is the first of Kingsolver's books that I read, and it's still my favorite, albeit that it's a collection of non-fiction essays. Maybe part of the reason is that I was also living in Tucson when I read it, so the things she had to say about life in that part of Arizona resonated with me. Beyond that, though, I just love the way she uses words - she writes lyrically. I enjoyed every single page of this book. So many of the things she grapples with are things I also have spent time agonizing over or worrying about or pondering. Her pleasure in so many of the “small” things of life resonated with my own enjoyment of things such as ants scurrying, and tuis in the tree outside my window, and children discovering wonders. And she’s very witty. I really enjoyed this book. Like "Small Wonder" it was a book of essays, but less militantly environmental. My favorite of the essays was "Jabberwocky" where she discusses art as politics. As in her other books her use of language is phenomenal and the book provided excellent thoughts and quotes. This book of essays was perfect for our monthly library genre circle and it was a perfect match for me. Kingsolver covered all areas in which I have a great interest in; parenting, human rights, environment, and nature. Every story spoke to me, the words flowed so smoothly and with such great detail. I truly enjoyed this book and am looking forward to trying other Kingsolver works. I stole this from my mother-in-law about a year ago. Now I can finally give it back, but it's one of those that I liked so much that I'd rather just keep it. I haven't read anything by Kingsolver before so I have no idea how this compares to her other work, but it's a collection of shortish essays. Some are pretty funny, most are poignant, and all made me long for her writer's life. Time to get on that. From the title essay: Embrace your own biology. Don't beat yourself up for acting like the human animal that you are. The rest of the essays: I laughed out loud more times than I can say, and I felt more connected to humanity as I read them. This is a book I go back to and re-read over and over because of that. I don't always agree with everything she says, but the essays always make me think and evaluate my own beliefs, biases, prejudices, actions. I love love love Kingsolver, and I think I love this collection of nonfiction essays even better than any of her fiction. It's written in the style of Annie Dillard, as a layperson who is interested in observation of the natural world and then exploration of underlying scientific principles. It's a beautifully written book and I reread it every several years. The book is a collection of essays on various autobiographical topics. It is a little bit of Thoreau, though less dense, and a little bit more of Dillard, but more straightforward. Kingsolver celebrates our animal nature. She refers to the “silly egghead of a species that we are” and goes on to say that “We tap our toes to chaste love songs about the silvery moon without recognizing them as hymns to copulation. We can dress up our drives, put them in three-piece suits or ballet slippers, but stil The book is a collection of essays on various autobiographical topics. It is a little bit of Thoreau, though less dense, and a little bit more of Dillard, but more straightforward. But then Kingsolver slips into what seems to be her own mythmaking, making us more an exception to the rest of life. * Rather than giving credit to E.O. Wilson for bringing freshness to our animal nature,** Kingsolver whiffs his thinking aside, calling it genetic determinism, and puts him into the same mold as those who want to prove superiority by the size of the skull and those whose arguments would get us into racism, sexism and aggression. She brings in the philosophical “is-ought” argument and states that the way we are is not the way we ought to be. But in some sense isn’t the reverse also true? She writes of her daughter’s emerging independence and a child’s need to develop into who they need to be. Where does that need come from and can it be not said that we ought to be who we are? Rather than genetic determinism, the argument is really about genetic tendencies and dispositions that move us one way and not another. To get to the ought side of the equation, doesn’t it help to know who we might be inclined to be? Only by bringing these to the surface can we hope to regulate ourselves in ways that work for others as well as ourselves. A deeper assessment of who we are leads to an animal nature that Kingsolver wants to deny. She writes for example that “It is human, to want the world to see us as we think we ought to be seen,” but she doesn’t ask why this is the case, why we care, and how this may relate to an inherent need for value and rank, and how these in turn might relate to our social (tribal) nature. Isn’t our social nature also the source of our cooperative nature, which is also part and parcel of Wilson’s arguments? And, for that matter, why do we flirt, and how does this relate to “copulation” and reproduction or, alternatively, as a tool for deceit and self-advancement? Her essay on the military (the Titan Missile Museum in Tucson leads to a discussion of nuclear warfare, and the consequences experienced by those in Hiroshima and Nagasaki) was painful to read. It’s a fair discussion, but she skirts the deeper, more challenging arguments. Much of her writing is overdone. It’s almost expression for expression’s sake, and soon the eyes begin to roll. But other times she keeps her focus on the thought, the experience, the event itself, and she nails it, just nails it, with her great writing skills. * She writes that “It’s starting to look as if the most shameful tradition of Western civilization is our need to deny we are animals…exempt from the natural order,” but her view is that while we evolved along with the rest of life, that applies to our physical being and our physiology, not behavior. She writes for example that “Want is a thing that unfurls unbidden like fungus, opening large upon itself, stopless, filling the sky. But needs, from one day to the next, are few enough to fit in a bucket, with room enough left to rattle like brittlebush in a dry wind.” Nifty writing, but what are these needs and where did they come from, and don’t we have behavioral tendencies designed to satisfy them in particular ways? In this collection of essays, rewritten and expanded versions, in many cases, from what has been previously published in various magazines, Kingsolver's skill and talent as an essayist shimmers with brilliance and sheer entertainment. Topics have wide range, covering nature, art, values and ethics, human nature and its foibles, politics and travels. Whether she is pondering the biological clocks of hermit crabs or espousing her views on violence and objectification of women on the silver screen, In this collection of essays, rewritten and expanded versions, in many cases, from what has been previously published in various magazines, Kingsolver's skill and talent as an essayist shimmers with brilliance and sheer entertainment. Topics have wide range, covering nature, art, values and ethics, human nature and its foibles, politics and travels. Whether she is pondering the biological clocks of hermit crabs or espousing her views on violence and objectification of women on the silver screen, or taking the reader along on the harsh realities of a not so glamorous book tour, her language is lush and poetic, flowing and vibrant, clever and memorable. I have been quoting her words to anyone who will listen, and thinking back to it as a kind of measuring stick for my personal observations. So what moved you to begin such a boycott of violence in movies? a friend asked me. We had been talking about popular contemporary movies, and why I had made sometimes surprising choices. While my inclination had been moving in that direction for some time now, it was Kingsolver's essay, "Careful What You Let In the Door," that had pushed me into a conscious awareness of how my viewing choices affected every other part of my life, the daily and seemingly miniscule choices I make. The results of such choices have been almost immediately apparent to me. The desensitization I had experienced toward atrocities in the news, to the daily disrespect I witness in various human interactions and my regretful tolerance of it, was lifting. Newly aware, I have been surfacing as if from a deep and dumb sleep. Kingsolver writes about her literary profession that writers may not write with politics in mind, yet "good art is political." As is hers. Words can and should move us, good art should change us, and a good writer is a person who wields a pen more powerful than any sword. In this particular essay, Kingsolver explores the function of violence in art (or media in general), visual or literary. Too often, she notes, such violence is perpetrated against women. "It turns out," writes Kingsolver about an inadvertant movie choice, "I'd rented the convincing illusion of helpless, attractive women being jeopardized, tortured, or dead, for no good reason I could think of after it was over." Pondering this, she concludes that violence in movies or video games (or various other formats) too often appears merely for its sensationalist effect, while in literature a writer has the ability to expand upon a violent scene to fully show its consequences. Because violence always has consequences. It is the absence of those consequences in our daily media diet, separate from the realm of reality, that has led to a society that hardly blinks at its constant appearance upon the screens of our minds. All of which, she argues, with time turns us into hardened and numb creatures, willing to not only view violence, but to tolerate it, potentially even to participate in it. So an essay moves us to change our viewing habits. Art creates positive change. But Kingsolver can just as easily write an essay that makes us laugh, as in her story of joining a literary rock band, allowing herself to look the fool for our entertainment. In "Somebody's Baby," her message takes on a ponderous seriousness in considering how little we care for our youngest generations, even while we claim to be a family oriented society. Her call to us is to consider that it is not just the parent's job to care for the child, but it is the obligation of the the entire nation, to care for and nurture our young. We are, she writes, raising Presidents-in-training, yet our attitude is "every family for itself." barbara Kingsolver is one of my favorite writers. She not only is eloquent and touching, she chooses to stand and voice opinions that are not the most popular with a convincing ferocity that makes me believe in humanity. This is the first book I read of hers that is made up of short stories. Sometimes novelists do not do well with short stories, or vice versa. However, Barbara Kingsolver is someone who can interest us in different and poignant topics without missing a beat and then move on to the barbara Kingsolver is one of my favorite writers. She not only is eloquent and touching, she chooses to stand and voice opinions that are not the most popular with a convincing ferocity that makes me believe in humanity. This is the first book I read of hers that is made up of short stories. Sometimes novelists do not do well with short stories, or vice versa. However, Barbara Kingsolver is someone who can interest us in different and poignant topics without missing a beat and then move on to the next story, all the while bringing into our conscience the wrong doings or the mere basic needs that make up humans. High tide in Tucson has twenty five stories in it. They are re-written stories that have been previously published or read aloud in conventions by the author. 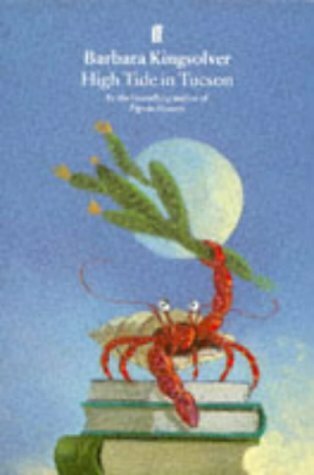 The first story, "High tide in Tucson", talks about a hermit crab that unknowingly is brought back to Arizona from an ocean trip and the way it establishes itself in a new environment is the observation at hand. It serves as a point of comparison to see how this crab, away from the surf and water still continues to behave as if there are tides that influence it. The author uses this as a basis of comparison to analyze human behaviour and our own imaginary or not High tides that are created by the moon. "In my own worst seasons I've come back from the colorless world of despair by forcing myself to look hard, for a long time, at a single glorious thing: a flame of red geranium outside my bedroom window. And then another: my daughter in a yellow dress. And another: the perfect outline of a full, dark sphere behind the crescent moon. Until I learned to be in love with my life again. Like a stroke victim retraining new parts of the brain to grasp lost skills, I have taught myself joy, over and over again." (pg 15). "Creation stories", the second story talks about driving through the different neighborhoods and the different religions and beliefs of the people who live in them. It is about tolerance and equality. "Making Peace" is the third story. it is about the perception humans have on private property and the preposterous idea that everything within the confines of that property can belong to humans, including other life and therefore the right to do with that life as one pleases... It is good food for thought! "Life without Go-Go boots" talks about fashion and how young girls and women sometimes feel the need to have these fashion items in order to feel a belonging to a group, and how the lack of those articles can define someone as an outcast. It is a cruel and hard lesson sometimes to not follow the trend, but in the long run sometimes the harder path makes a person stronger and teaches the values of self esteem by deed and not by something so ephemeral as clothes. Of course the question is, do we let our children follow the path of self definition or do we cave in and get them to Go-Go boots? "Semper Fi" is a poignant story about fidelity in a man. It discusses how the mind of a sports man works and what that tells you about the way he sees faithfulness. I enjoyed reading this very accurate and interesting point of view. "Civil Disobedience at Breakfast" talks about the struggle between building a strong personality in your child vs. the bonking of heads with a strong willed child. It ponders which is best, to try and submit a child's will or to let them win the battle and create a strong individual. To build self esteem and self respect is what is most important, along with teaching them that they are valuable, because only so can we bring fully developed and well equipped humans into a harsh world. "Confessions of a Reluctant rock goddess" is a fun story on how editorial houses search amongst their authors to see which ones are the "tour-able" authors that can go on book tours and sell their books. During one of these tours she is invited to participate in a rock show that will be done by a group of authors, much like her, who may not be musically talented, but will be willing to play rock none-the-less. It is a story about pushing the boundaries of what one thinks oneself capable of doing and the desire to participate even at the risk of failing or being ridiculous. "Postcards from Imaginary Mom" talks about promoting the books the author writes. Most people want a seven word description of what the story is about. it talks about the hardship of touring for promotion, and also about the little happiness those tours bring in the manner of surprises. "The Vibrations of the Djoogbe" talks about the travels through Benin, in Africa and how different tribes there identify themselves by their tribe name instead of their personal name. Barbara Kingsolver is greeted as "Yovo! Yovo!" meaning white person. She cringes at the word and learns that different people have different ways of thinking and living, and she also realizes that this is the place where voodoo comes from. Quote: "Art has the power not only to sooth a savage breast, but to change a savage mind. A novel can make us weep over the same events that might hardly give us pause if we read them in the newspaper. Even though the tragedy in the newspaper happened to real people, while to one in the novel happened in the author's imagination... A novel works its magic by putting a reader inside another person's life. The pace is slow as life. It's as detailed as life. It requires you, the reader, to fill an outline of words with pictures drawn subconsciously from our own life, so that the story feels more personal than the sets designed by someone else and handed over via TV or movies. Literature duplicates the experience of living in a way that nothing else can, drawing you so fully into another life that you temporarily forget you have one of your own. That is why you read it, and might even sit up in bed till early dawn, throwing your whole tomorrow out of whack, simply to find out what happens to someone who, you know perfectly well, are all made up. It's why you might find yourself crying, even if you aren't the crying kind...The power of fiction is to create empathy. It lifts you away from your chair and stuffs you gently down inside someone else's point of view. It differs drastically from the newspaper, which imparts information while allowing you to remain rooted in your own perspective. A newspaper cld tell you that one hundred people, say, in an airplane, or in Israel, or in Iraq, have died today. And you can think to yourself, 'How very sad! ', then turn the page and see how the Wildcats fared. But a novel could take just one of those hundred lives and show you exactly how it felt to be that person rising from bed in the morning, watching the desert light on the tile of her doorway and on the curve of her daughter's cheek. You would taste that person's breakfast, and love her family, and sort through her worries as your own, and know that a death in that household will be the end of the only life that someone will ever have. As important as yours, as important as mine. (Pg 230-231). "The forest in the seeds" is again about nature conservancy and the importance to protect a way of life hat is disappearing, like Thoreau's life and many of the different animals he observed. we need to slow down and smell the flowers! "Careful what you let in" talks about violence in art and the need of it to teach lessons as opposed to violence and the propagation of that lifestyle simply by showing it. It is a great story because both points have merits to it and especially in the SAmerican society where we have grown so used to gratuitous violence for entertainment and what this does to us as individuals and as a society that becomes more and more desensitized the more we watch it and experience it, even knowing that the violence is fake. "The not so deadly sin" talks about lying and how authors invent stories to bring in a truth about something. "Reprise" is the last one and it nicely brings back the story to her little crab and how molting is a very important part of growing up, not just for the crab but for us humans as well. I specifically enjoyed her essays on art and writing, and they are worth revisiting. I am such a Barbara Kingsolver fan that it's hard for me to believe I had not read this book. Although it was published in 1995, her thoughts about the state of the world are just as appropriate today as they were then. Thngs haven't changed much! This was a lovely little collection that describes Kingsolver's early life and rocky adult path. It's realistic and she never sugarcoats or apologizes for her success as a writer, which is something I really enjoy since so many women writers are often bashful or shy about their abilities. Kingsolver owns them, and her flaws, and shows that it's okay to have both. I love her for this, and for her frankness about her divorce, her financial struggles and her ability to push on despite them. You know how when you have a really great dessert, sometimes you have to stop between bites to just swirl the taste around in your mouth? No joke; that's what Barbara Kingsolver's writing is like. Sometimes I would put the book down and repeat, out loud, one of her sentences. She's a master at throwing words together. So good, that I sometimes felt I couldn't digest all the beauty on the page. Despite the unparalleled writing - "Civil Disobedience at Breakfast" is the best piece on having childre You know how when you have a really great dessert, sometimes you have to stop between bites to just swirl the taste around in your mouth? No joke; that's what Barbara Kingsolver's writing is like. Sometimes I would put the book down and repeat, out loud, one of her sentences. She's a master at throwing words together. So good, that I sometimes felt I couldn't digest all the beauty on the page. This was a fun read - it is interesting to see a personal side of someone you have only read in novels. The book is kind of 'old' now, and the references almost quaint (like how much time the media was spending on OJ Simpson and Tonya Harding), but it's shocking how applicable these observations still are to current times. There is definitely some timeless wisdom in here. "A novel works its magic by putting a reader inside another person's life. The pace is as slow as lif This was a fun read - it is interesting to see a personal side of someone you have only read in novels. The book is kind of 'old' now, and the references almost quaint (like how much time the media was spending on OJ Simpson and Tonya Harding), but it's shocking how applicable these observations still are to current times. There is definitely some timeless wisdom in here. "A novel works its magic by putting a reader inside another person's life. The pace is as slow as life. It's as detailed as life. It requires you, the reader, to fill in an outline of words with vivid pictures drawn subconsciously from your own life, so that the story feels more personal than the sets designed by someone else and handed over via TV or movies." This was the my first introduction to non-fiction essay reading and it's been a tough comparison for all subsequent books since then. I have always loved Kingsolver's fiction, feeling like she was able to express character and imagery in such a way that I could actually hear, see, smell, touch, and taste it. This collection of essays was that exact same experience of being present with her in the moment. It probably helps that her idealogies resonant so well with my own - she can just express it This was the my first introduction to non-fiction essay reading and it's been a tough comparison for all subsequent books since then. I have always loved Kingsolver's fiction, feeling like she was able to express character and imagery in such a way that I could actually hear, see, smell, touch, and taste it. This collection of essays was that exact same experience of being present with her in the moment. It probably helps that her idealogies resonant so well with my own - she can just express it more eloquently than I. This book of essays by Barbara Kingsolver is one of those wonderful books that you want to hang on to just in case you need some special inspiration or direction some day when you feel particularly challenged.. Topics have a wide range, covering nature, art, values and ethics, human nature, politics and travels. She ponders the challenges of a two year old, the life of a hermit crab, and book tours and band tours. Kingsolver gives her views on violence in movies and novels that was very intersti This book of essays by Barbara Kingsolver is one of those wonderful books that you want to hang on to just in case you need some special inspiration or direction some day when you feel particularly challenged.. Topics have a wide range, covering nature, art, values and ethics, human nature, politics and travels. She ponders the challenges of a two year old, the life of a hermit crab, and book tours and band tours. Kingsolver gives her views on violence in movies and novels that was very intersting and her love of books and reading and how that led to her writing. Her language is lush and poetic, flowing and vibrant, clever and memorable. What a gift. Love this book of essays. She has a wonderful way with language and descriptive phrases that make me smile, like "I was stomping through life in my seven-league boots, entirely unaware of how my life was about to snag on a doorframe, sending me staggering backward, ..." These essays about life, being a writer, a child, a mother, a woman, a human observing nature, a white person visiting Native American lands, really made me think and consider. I want to re-read them in a little while. I liked Kingsolver's fiction so much that I decided to venture into her nonfiction, too, and have been hooked on the personal essay ever since. Here's a collection of essays that are rooted in observation of the everyday life around her that explore topics sometimes at broader levels (as in cultural, societal, and political traits across the country) and sometimes at more specific, detailed levels (as in the essays that go back to her roots in biology). I keep trying to like Kingsolver. So many people that I like and respect thing so highly of her. So I listened to this as an audiobook, hoping that her speaking voice would endear her to me. While some of her essays had some poignant parts, I found her even more self absorbed than I did before. I fear that I have grown accustomed to really disliking her overly flowery style. Sorry. I tried. That said, her essay about how American's really seem to hate children was spot on. What a talented women Kingsolver is! Her writing in this book is moving and thought-provoking. So many different topics are covered by this collection of essays: child-rearing, environment, culture, nature, family, politics. Several essays contained passages or lines I want to keep to read again and again--very inspiring. Barbara Kingsolver is an American novelist, essayist, and poet. She was raised in rural Kentucky and lived briefly in Africa in her early childhood. Kingsolver earned degrees in Biology at DePauw University and the University of Arizona and worked as a freelance writer before she began writing novels. Her most famous works include The Poisonwood Bible, the tale of a missionary family in the Congo, Barbara Kingsolver is an American novelist, essayist, and poet. She was raised in rural Kentucky and lived briefly in Africa in her early childhood. Kingsolver earned degrees in Biology at DePauw University and the University of Arizona and worked as a freelance writer before she began writing novels. Her most famous works include The Poisonwood Bible, the tale of a missionary family in the Congo, and Animal, Vegetable, Miracle, a non-fiction account of her family's attempts to eat locally.